Looking at his disciples, he said: Blessed are you who are poor, for yours is the kingdom of God. 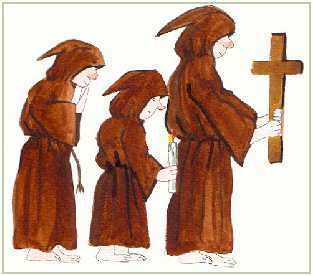 The monks of Diksmijde, Belgium were well known in their region. When one passed away, you would expect that there would be sadness. The beggars of the region, however, would rejoice at such occasions, because for the next thirty days, the deceased’s meal would be given to them! Those of us who live in countries where abundance is the norm have a hard time realizing just what those who truly have nothing must face every day. When adversity hits, we tend to seclude ourselves from others, and we are inclined to abandon reaching out to others through the ministry God has bestowed upon us. When we hurt, we can’t deal with others who are hurting! Those who truly have nothing, however, including those who are spiritually poor, tend to have an attitude of dependency and expectation. They do not have a backup plan. They can only rely completely on God! As a result, they are geared to experience God fully, to enjoy His presence in the midst of their trials. What does one do when cancer has invaded the body? Most tend to become depressed, even fearful. Someone I know, however, faced this ailment with anticipation, for she knew God would be there for her. Her doctor advised her to cut down in her responsibilities, and especially her ministry. It’s quite human to conclude that ministering to others is less important than taking care of ourselves! She did cut down on her responsibilities, but she clung to ministry, for this was one thing she was doing for God, the One who was sustaining her. Instead of terror, she faced peace during her “ordeal”, and she experienced God more vividly than ever before in her life. He is, after all, her Best Friend. May we all live expectantly. When we do, we will experience God more fully in our lives. Circumstances are nothing but opportunities to see Him at work. May we live the way Jesus instructed His disciples to live: With the attitude of expecting the impossible, the attitude that we see among those who truly have nothing. And may we never forget to help those in need, no matter how dire our situation. Dear Lord, we pray that we would use the circumstances that come our way as a chance to completely trust in You. In Jesus’ Name, Amen.